The Iowa Barnstormers could not produce against the top ranked team of the West last week, the Arizona Rattlers. Iowa was knocked on their heels right at the beginning of play as Arizona took a 21-6 lead in the first quarter, capitalizing on two costly Barnstormer turnovers. The Barnstormers were able to match the Rattlers score for score most of the remainder of the game and even outscored Arizona by a point in the third quarter, but their perseverance had no avail. Arizona walked away with a 61-41 victory over the Barnstormers, improving to an 11-2 season record, while Iowa slid to 3-9. 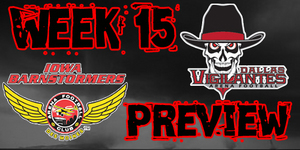 The Iowa Barnstormers (3-9) will be playing on their home turf this week in a conference match up against the Dallas Vigilantes (7-5). Dallas has a top-five offense, lead by QB Dan Raudabaugh, that they will bring to the game, however, their defense looks weak on paper, placing second to last in the league. Iowa will need to snap out of their first-quarter slump to compete with Dallas, who has proven to be a strong first-half team. The Barnstormers will be looking to their raucous support group of fans to cheer them to victory this Father’s Day weekend. The Dallas Vigilantes took on the San Jose SaberCats last week on their home turf. Dallas came out strong from beginning with a 28-14 lead after the first quarter. The SaberCats were able to match the scores of the Vigilantes in the second quarter but still went into the locker room trailing by two touchdowns. The second half was a little slower pace for both teams as only 43 total points were put on the board. Dallas took the game 70-57, improving their record to 7-5 for the season, while the SaberCats dropped to 5-7, posting their fifth straight loss. Iowa Barnstormers vs Dallas Vigilantes will be broadcast on Mediacom Connections Channel 22 and LIVE on 1700 AM The Champ, on the Internet at www.theiowabarnstormers.com and at www.nifty-tv.com. -This will be the third meeting between the Iowa Barnstormers and the Dallas Vigilantes in their franchises’ history. The series is currently tied at one a piece with the Vigilantes defeating the Barnstormers earlier this season. Jesse Schmidt led all receivers last week against the Arizona Ratters with 11 receptions for 123 yards, including 3 touchdowns. Schmidt is currently ranked third in the league for total receiving yards at 1,334 and second in the league for scoring, averaging 17.7 points per game, with a total of 212 points for the season. He accounts for 35.2% of Iowa’s total points for the season.